Camp Getaway is a campsite owned by District9800 located in Axedale, 20 kms from Bendigo. Club members spent a weekend in October working very hard there!! Tasks tackled and completed including cutting down dead trees, clearing leaf litter, concreting, pruning, welding and the list went on and on. This is a good fun weekend - plenty of fellowship, good company, good food and results you can see. Reclink Austr alia has been transforming the lives of people experiencing disadvantage through its Victorian Football League for more than 25 years. This is an all age, all ability, all gender competition involving 13 teams. The program has recently been evaluated by La Trobe University for its Social Return on Investment. The report found that every $1 invested in cash, staff time, volunteer time and other resources to operate the Victorian Reclink Australia Football League, generates at least .$8.94 in social value. This is achieved through in-creased social connectedness, wellbeing and mental health status of participants, employment outcomes, personal development, skill development, a decreased risk of gambling, a decreased risk of suicidal thoughts and behaviours, physical health, a decrease in high risk alcohol and drug behaviour; and crime reduction. 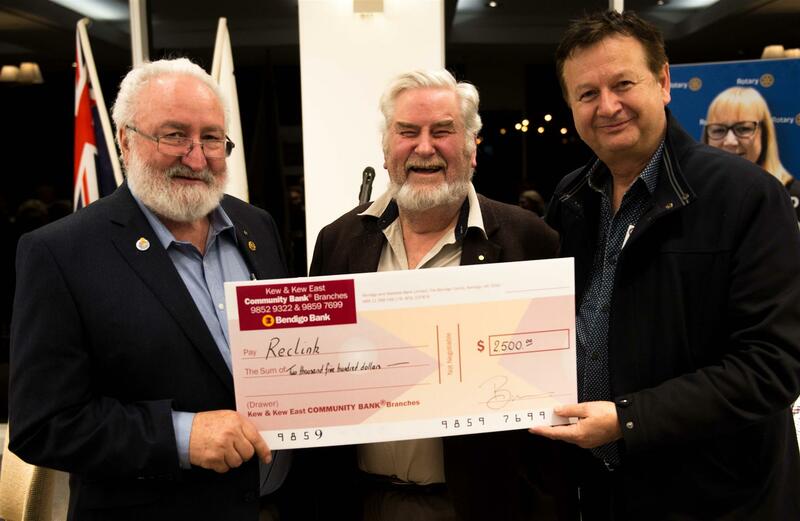 A key part of Reclink’s fund raising is the Community Cup, which RCNB has been involved with since the first event at Elsternwick Park in 2009. Proceeds from our BBQ trailer sales at the Community Cup this year was presented by President Nino Sofra to Reclink CEO John Ballis. 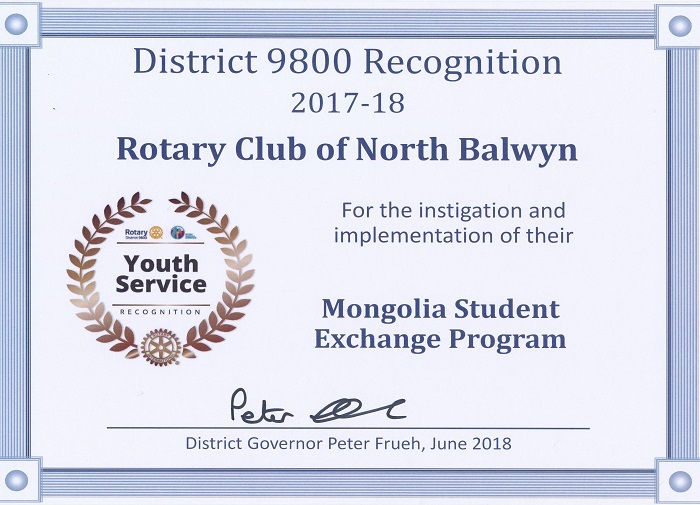 Congratulations to th e Youth Committee of the Club who were recognised with the Youth Service Award in the recent District 9800 Recognitions. This is a new and innovative Youth Exchange program between secondary students from Melbourne and Ulambataar in Mongolia. This intercultural exchange provided many opportunities for vocational and cultural learnings, especially when the Mongolian students were home hosted by Club members and experienced a diverse range of activities in Melbourne and regional Victoria. Very well done to everyone involved! !